Oxylipins - a family of oxygenated unsaturated carboxylic acids that play important roles in plant signaling and defense are usually produced via a serial reaction of lipoxygenases and hydroperoxide lyases belonging to CYP74 family. For instance, 12-hydroxy-cis-9-dodecenoic acid, 12-oxo-cis-9-dodecenoic acid, and 1,12-dodec-9-enedioic acid, which were reported to stimulate growth of the roots of plant seedlings, were synthesized from α-linolenic acid by 13-lipoxygenases, hydroperoxide lyases, and alcohol dehydrogenases. 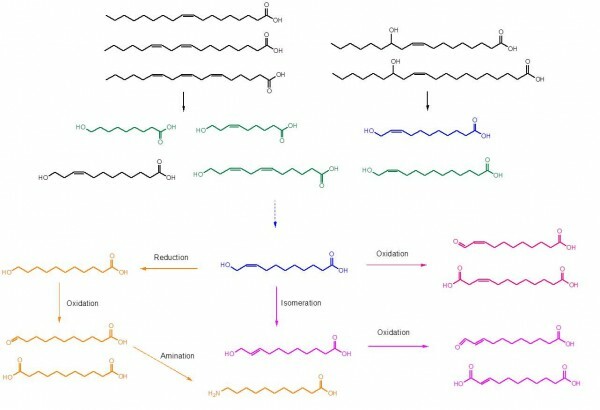 Since the oxygenated carboxylic acids have a great potential not only as agrochemicals but also as building blocks and/or additives for the production of plastics (e.g., polyamides, polyesters), resins, hot melt adhesives, powder coatings, corrosion inhibitors, lubricants, plasticizers, greases, and perfumes, their biosynthesis have been extensively investigated. However, productivity of the biocatalysts were often limited by the low expression level of the plant enzymes in the microbial cells. Our group created a synthetic biocatalytic cascade reaction, which can be used to produce high value C9 to C13 ω-hydroxycarboxylic acids, α,ω-dicarboxylic acids, and ω-aminocarboxylic acids from cost-effective renewable fatty acids and/or plant oils. ω-Hydroxycarboxylic acids (indicated by green and blue in the figure below) were produced from oxidative cleavage of fatty acids (indicated by black in the figure) via enzymatic reactions involving a fatty acid double bond hydratase, an alcohol dehydrogenase (ADH), a Baeyer-Villiger monooxygenase (BVMO), and an esterase. For instance, 11-hydroxy-cis-9-undecenoic acid (blue in the figure) and n-heptanoic acid was produced from ricinoleic acid by the recombinant Escherichia coli expressing the ADH from Micrococcus luteus NCTC2665, the BVMO from Pseudomonas putida KT2440, and the esterase from P. fluorescens SIK WI. In addition, 9-hydroxynonanoic acid, 9-hydroxy-cis-6-nonenoic acid, 11-hydroxy-cis-9-undecenoic acid, 12-hydroxy-cis-9-dodecenoic acid, 12-hydroxy-cis-6,9-dodecadienoic acid, and 13-hydroxy-cis-12-tridecenoic acid were synthesized from oleic acid, linoleic acid, γ-linolenic acid, and lesquerolic acid via the enzyme cascade. ω-Hydroxycarboxylic acids were further oxidized to α,ω-dicarboxylic acids by another alcohol dehydrogenase (i.e., AlkJ from P. putida GPo1) or converted into ω-aminocarboxylic acids by a serial combination of AlkJ and an ω-transaminase of Silicibacter pomeroyi. For example, 1,9-nonanedioic acid (i.e., azelaic acid) was produced from 9-hydroxynonanoic acid, which was prepared from oleic acid. 11-Aminoundecanoic acid was synthesized from ricinoleic acid via 11-hydroxy-cis-9-undecenoic acid. Overall, the enzyme cascade allowed to produce C9 to C13 α,ω-dicarboxylic acids and ω-aminocarboxylic acids directly from fatty acids. Although significant scientific and technological progress has been achieved for the sustainable production of biofuels and chemicals from renewable biomass, it remains difficult to produce the secondary metabolites and signaling molecules of plants (e.g., oxylipins) in high yields. Here, we developed a recombinant E. coli-based biocatalyst containing the designed biotransformation pathways. The synthetic enzyme cascades allowed to produce a variety of functional carboxylic acids from long chain fatty acids in high yields. This study will contribute to development of sustainable bioprocesses to produce the valuable carboxylic acids. - Biotransformation of linoleic acid into hydroxy fatty acids and carboxylic acids using a linoleate double bond hydratase as key enzyme. Adv. Syn. Cat. In press. (Feb, 2015).